NOTE: Does not fit with factory subwoofer. If you DO NOT have the factory subwoofer underneath your back seat, you will need one of these part numbers. NOTE: Fits with factory subwoofer. If you DO have the factory subwoofer underneath your back seat, you will need one of these part numbers. NOTE: Fits models with 60/40 split bench seats only. 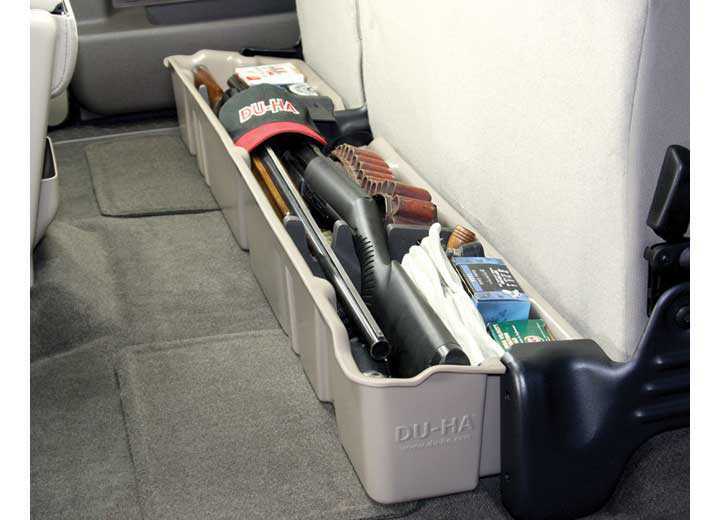 ; Metal factory trays under the seat will need to be removed to install the DU-HA. These can be interchanged if needed. NOTE: Does not fit with factory subwoofer. ; Underseat storage units are also available for this truck (60/40 split bench seats only). NOTE: Underseat storage units are also available for '03 models and newer (60/40 split bench seats only). Both underseat and behind-the-seat storage units will fit at the same time.